Adventures in Froyo: Just 10% Off in Exchange For Dignity? 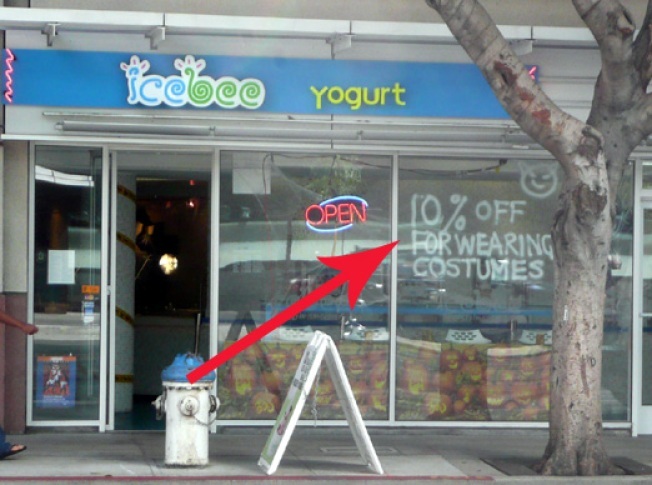 SoMa: The above ploy at Icebee was spotted on Mission over the weekend, and there's a chance that it might displace Swirl Culture's happy hour as the silliest move in the froyo wars (maybe). Some other places, like Chipotle, are doing Halloween promotions, albeit with two fairly notable differences: a) Chipotle's promotion is actually on Halloween rather than the week prior and b) you get more than a few cents off. I.e., until Friday hits, it will take a special breed of froyo lover to take advantage of this deal; Yelpers ready?